Have a virtual Easter egg hunt with DDA’s Easter Parade augmented reality iPhone application. Get the Easter Parade AR app at iTunes. When Apple developed the ARKit, it made augmented reality applications accessible to more users (anyone with a recent iPhone), while simplifying the design and development process to ensure custom applications could be produced for a much larger number of purposes. ARKit provides environment mapping coordinated with the iPhone’s camera, and interprets the phone’s movement within 3D space through the device’s on-board gyroscope, accelerometer, and magnetometer. By covering the essentials common to all augmented reality applications, the ARKit empowers app developers to focus on the unique opportunities for real-time enhancement of real-world environments. DDA sought to put the new toolkit to the test with a fun new app just in time for Easter. The new augmented reality iPhone application would leverage the advanced environment mapping capabilities of the ARKit to allow users to transform the visual landscape around themselves. The new app would be available to anyone with an iPhone model SE, 6, or above. The Easter Parade AR app allows users to drop in decorated Easter eggs of various designs and sizes throughout their environment. The eggs can be expanded or contracted in size through user’s finger motions. Users can also place bunnies around them that hop continuously, even after leaving the scene and returning. The features can make for a simple virtual Easter egg hunt. Screenshots can be captured and saved to capture the fun atmosphere provided by the augmented reality app in still images. 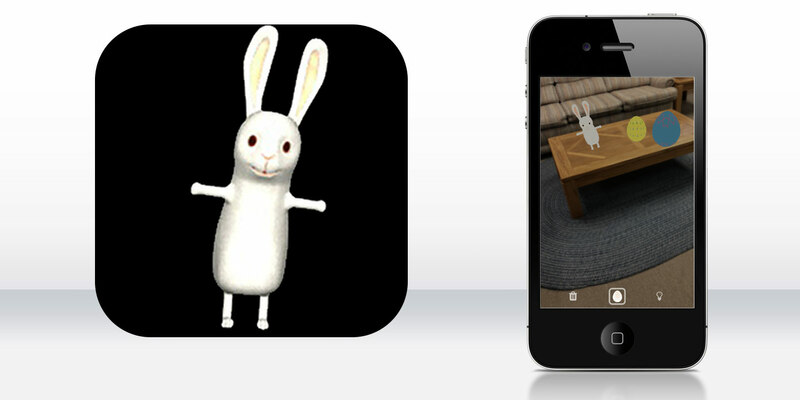 The Easter Parade AR app gives users a taste of what will come as new interactions between simulated objects and the real world are made possible through augmented reality applications.